This is my story of how I almost won $20k. 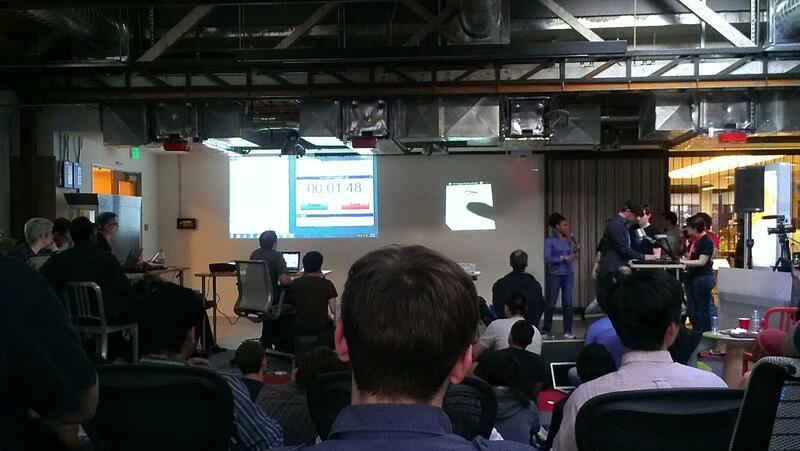 This weekend I participated in the AT&T Mobile HTML5 Hackathon. I had very mixed feelings in the beginning about my participation for multiple reasons. The first reason in which I was against participating is because I have a number of uncompleted apps from previous hackathons that I have yet to complete, and I didn’t want another incomplete project. But the top prize was $20k. The second reason in which I was against participating is because I’ve seen a lot of hackathons warped with startup teams that have pre-existing applications and/or code, who participate in these hacks for press reasons or for the purse. There’s nothing worse than working hard during a hackathon and seeing the top prize given to a startup team with a pre-existing app. I just have a “traditional view” of hackathons, in which the competition should be based on the work performed during the event. So, I decided that I would attend the hackathon, but enter into the competition. I would use the time spent at the hackathon to complete a previous project and learn about some technologies for mobile web. My goal: to convert one of my web projects into a mobile app. Then, Alex Donn, the organizer of the AT&T hackathon, made an announcement at the hackathon. His announce can be loosely quoted as, “You will be judged on the work done here, we are checking GitHubs.” I was pretty impressed that Alex still honored the “traditional view” of a hackathon, and now the opportunity to win $20k appeared to be more fair. So new goal… win $20k. $20k requirements — application that made the best use of the AT&T API and Facebook Social Graph. I already had an idea for the hack. My idea was to create a mobile app that recreates the mixtape experience, and it could be shared with friends. The vision was to recreate the nostalgic feeling around creating mixtapes on cassette with your favorite tunes. It also included the nostalgic feeling of sharing these tapes with friends, possibly a crush, or a feel better tape for a friend. It was simple app and could be done in the next 24 hours. Next step, find a team. I recruited friend, Jennifer Arguello, who I met at a Women Who Code event. She quickly pulled in Leah (I met previously at Women Who Code event), Jesse Martinez (I know from Latino Startup Alliance), and Harald and Brendan (her co-workers at Mozilla). As a team, we pitched a few ideas to each other, but it was decided that the Mix Tape App could be done in the time frame allowed. That being said, during the hack I wanted to focus more on development on the backend. Plus, there was a cool demo by Tiggzi, which showed the ease in creating a mobile app. Harald and Brendan expressed concern about using unfamiliar tools and frameworks. But I saw this as an opportunity to make use of a hackathon-sponsored app, and possibly win a secondary prize if not the first. I also met Tim from Apigee’s Usergrid. He sat down with me and convinced me of the magic of Usergrid. Between Tiggzi and Usergrid, I was convinced this app could be done with less effort. As I went to set up Tiggzi and Usergrid, Brendan and Harald focused on the music integration components of the app, using node and backbone. After arriving home at 1am, I stayed up til 4am learning both Tiggzi and Usergrid. We met back at the hackathon the next day at 11am on Saturday. Saturday: 6:15pm — I struggled with getting the sms working in Node.js, and handed it over to Harald. Harald had gotten basic Facebook integration and was able to retrieve a user’s Facebook friends, but had not gotten to the point where he could publish to someone’s timeline. He now had to deal with my failure of a mess with integration with AT&T SMS. Saturday: 7pm – Competition over. Our app had basic functions to search for music and play it from a mobile phone. However, integration with Facebook and AT&T SMS was minimal based on time limits. End result — The demo of our app went well. Received tremendous feedback from a lot of people about the app and most people loved the concept and believed it was a winner. Out of more than 20 teams that presented, we believed we were in the top three. When the judges deliberated, we were called up along with another team to verify features. The night was an anxiety rollar coaster. If we thought our app sucked, then it would’ve been fine. But we heard from many people that thought we were going to win it. If $20k was food, it was almost as if we could taste the $20k. End result, the other team won it. $20k. This is my story of how I almost won $20k. A bit disappointment, I went home and sulked on my almost $20k. My goals changed throughout the hackathon. First, I just wanted a mobile app for one of my projects and then I changed to wanting to win the $20k, or a secondary prize. I went home with neither. I did learn some new technologies, but that wasn’t the primary goal of my participation. Lesson: Choose one goal, stick with it, aim for it. I didn’t have a good plan for my goal for winning nor did I make it a primary focus. If the requirements of the $20k was best use of Facebook social graph and AT&T SMS. The framework for integrating Facebook and AT&T SMS should’ve been built first, instead of at the last hour. Lesson: Identify the basic requirements of the goal and work on it first. The decision of learning new tools vs building within the comfort zone was a risky one. It’s pretty ambitious to build an app within 24 hours, even more ambitious to learn new tools and then build an app with them. I took a risk to try and learn something new in hopes that it would save time. It ended up costing more time. Lesson: Unless its specified in the requirement of the goal, build with tools that are familiar. 24 hours is not a lot of time. This post was originally posted at Engineers Don’t Blog. About the guest blogger: Hadiyah Mujhid is an entrepreneur and software engineer currently working on early stage startups in San Francisco. She co-runs Black Founders, an organization that promotes diversity in the startup ecosystem. Hadiyah blogs at Engineers Don’t Blog. Follow her on Twitter at @hadiyahdotme.